So much bling, so much technology – and so much vehicle. 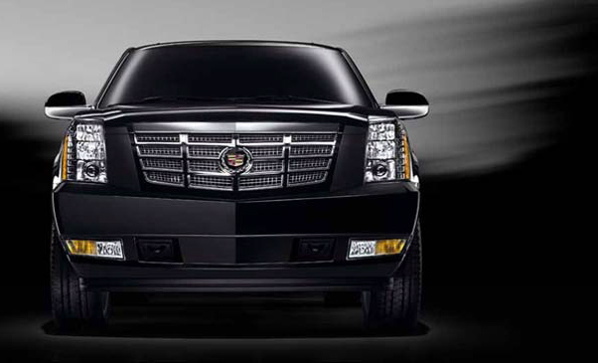 Created to impress up to eight passengers, the Cadillac Escalade Hybrid is over five and a half metres long, two wide and nearly two high. This wasn’t a road test as much a final exam. And one with so many surprises. Surprise 1: It handles well for a giant. At first, I felt like a private school mom, instinctively driving with fingers extended so as not to break a nail. Being this high up is like driving from a really comfortable lifeguard’s chair, the urge to thrust in the corners attenuated significantly. But after a couple of drives, it seduces. The standard Magnetic Ride Control is so smooth, it’s like you’re floating. Which is fine for the passengers but I like to participate. Surprisingly there was a sport transmission with paddles for 4 speeds – which sounds wrong in so vast a beast, but it brought me closer into the drive. I felt the road. Better still, you can turn off the traction control. Sadly there was no snowy parking lot to slip around. But I did get to enjoy pushing it in corners and traffic. GM’s engineers didn’t neglect the driver for the comfort of passengers. Surprise 2: It sips fuel genteelly. You’d expect its 6-litre V-8 to roar but it’s almost silent. For tootling about town, if you keep your foot light, you can use nearly no fuel. I had the Escalade Hybrid for six days with almost no highway driving and was surprised how little gas it used, aided slightly by regenerative braking. Then I got on the highway on day six. Burp! Non-surprise: It has heaps of bling. Running boards emerge like wings from chitty-chitty-bang-bang when you open a door. (You can turn the option off, but why?) Bose creates a concert hall, enhanced by the cavernous vastness. There’s heating for your back as well as your rump. Tri-zone climate control means you, the front passenger, and the rear passengers can each have their own level of cool. A DVD player with headphones for passengers keep things quiet in the back. And so on.